Over the years, we have been delighted to have been selected as Charity of the Year by a range of different organisations. The relationships we have built up through these partnerships have been mutually beneficial and valuable and have helped us gain much needed support. This year, Centre For Dentistry selected us as their Charity of the Year and we’ve been continually impressed by their dedication in supporting Anxiety UK through a range of events and activities. So what makes a good Charity of the Year partner? We’re looking for an organisation to build an ongoing relationship with so rather than viewing the Charity of the Year scheme as another notch to mark off our fundraising list, we’re looking for an organisation we can work with throughout the year on various campaigns. 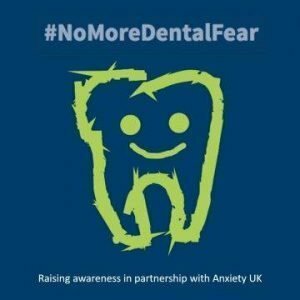 Over the past year for example, Centre For Dentistry (CfD) and Anxiety UK have used the hashtag #NoMoreDentalFear to raise awareness of how those with dental phobia can manage their anxiety. It’s been incredibly inspiring to see the passion that CfD staff have shown in supporting Anxiety UK this year. For example, CfD branches all over the country have organised and participated in their own fundraising events and have for example undertaken sponsored walks and in-store competitions. In fact it’s fair to say that they’ve really gone above and beyond in raising awareness of anxiety as a condition and Anxiety UK as a charity! Anxiety UK have always sought partners that share our core values of Commitment, Responsiveness and Understanding, and who wish to work with us on the common goal of helping to make the despair caused by anxiety a thing of the past. 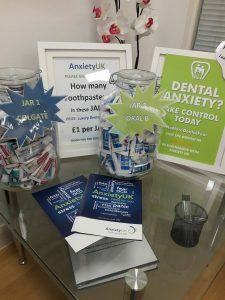 In 2017/8, Anxiety UK and CfD partnered through the Charity of the Year relationship to create a bespoke guide on Dental Anxiety and which has been subsequently disseminated across CfD practices. The booklet includes tips on finding a supportive dentist and what to expect at an appointment. It’s true to say that we loved working with CfD to find ways to complement our expert knowledge of anxiety with their vast experience of dentistry and perfecting and supporting patient experience. Could you be our next Charity of the Year partner? We are currently looking for a new Charity Of The Year partner for 2018/ 2019. If your company is interested in working together, please fill out an expression of interest form to start a dialogue with Anxiety UK available here.